If you are applying for college, you may be currently wading through the world of admissions tests. Figuring out which test to take, when to take it, and how to prepare for it can be confusing, but don’t worry – the library has some great free resources to help you out. High school juniors will take the ACT in school on April 19th this year. Starting in 2017, juniors will take the SAT in school instead, but for 2016 the ACT is still being administered. Many colleges accept either the ACT or the SAT, but if you have a specific school you would like to apply to in mind, be sure to check their admission requirements to find out what tests they may require. If you are not planning to take the ACT in school, you can find upcoming test dates and other information on the ACT website – the next upcoming dates in the Grand Junction area are at Colorado Mesa University on April 9th and June 11th. 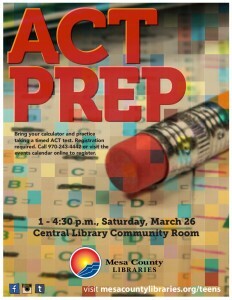 On Saturday, March 26th from 1-4:30pm, the Central Library will host a timed practice ACT test. Participants will get an answer key immediately following the test and will be allowed to take home all materials in order to study and go over results. The practice test will simulate all parts of the test except for the optional writing section. We will also go over some test taking strategies and information to help students do their best on test day. The ACT practice test is free, but registration is required – please sign up online or call 970-243-4442 to reserve your spot. Learning Express – This is an online resource available through the Mesa County Libraries website. The ACT Test Preparation Tutorial includes interactive lessons and practice exercises – all you need is your library card to sign in from any computer. Visit the College Preparation Center in Learning Express to access not just ACT materials, but prep for the SAT, AP exams, and more. Books and other materials available for checkout – A list of up-to-date ACT, SAT, and AP exam resources available for checkout with your Mesa County Libraries card. Best of luck with your upcoming test – please let us know if there is anything else we can do to help! Posted in Programs/Classes, Teens, Virtual Branch.